On the way home from a sailfish-fishing trip in Guatemala, Katka Svagrova and me started to plan the next trip. Fly-fishing for sailfish is incredibly fun, don’t get me wrong, but the captain is literally doing 95% of the work. All you have to do is to toss your big bulky fly out there no more than 10 meters, and the game is on before you have time to even think. In the taxi, on the way to the airport, we decided to go for Baja California on the west coast of Mexico. Six months later we found ourselves roaming the white beaches of the Sea Of Cortez, searching for the illusive roosterfish. I had packet two sets of rods for our one week of fishing. My guideline RSi 8wt and 9wt was accompanied with matching VOSSO to gain enough stopping power. The VOSSO 79 was loaded with no less than 300 meter of thin and strong PE-backing, in order to never get left spooled on the beach. The result was a 9wt set-up where rod and reel combined has the total weight of 321 grams! That’s the about the same weight as my 7wt seatrout set-up back home! This lightweight setup came in handy already the first day, when blind casting from boat was the strategy of choice. Big mullet patterns, on heavy gear, and rolly-polly every single cast made me sweat the whole day. Even though no fish was landed, my casts of the 7th hour were still flying full length without pain, and I woke up the next morning ready to repeat it all. And that exactly what we did. But in contrast to the first day, big roosterfish was showing themselves already the first drift. Tall dorsal fins were slicing through the surface followed by big splashes when the fish hit the sardines. I tied on a gummy minnow and it did not take long before it got smashed by one of this giant fish. You might have seen BBC clip where GT’s are hitting birds in the surface? This fish were hitting sardines exactly the same way and I can assure you that many of these roosters were at least as big as those GT’s in that clip. The fight with a big roosterfish from a boat in deep water is a game of endurance. They don’t really run, and they don’t really jump. They go comfortably deep and stay there. What’s left for the angler is to put just enough pressure so that the hook don’t pull and keep doing it for as long as whatever will be required. This time the fight lasted 40 minutes, on a 9wt rod. 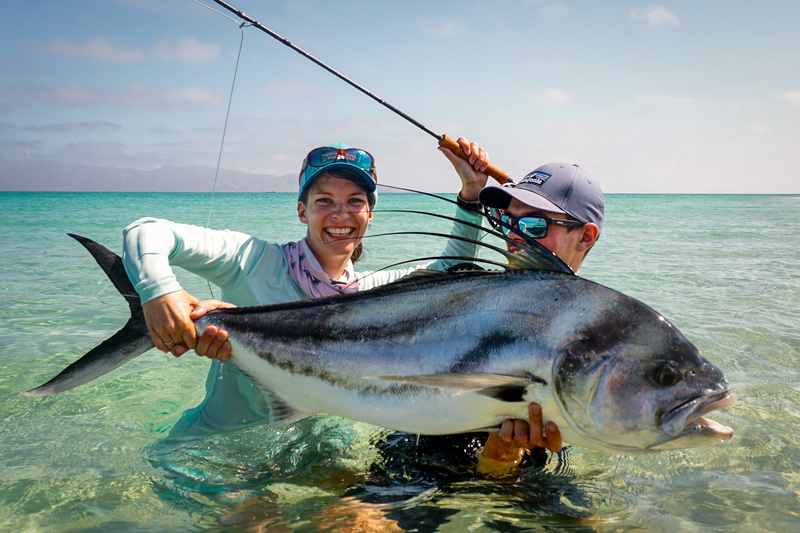 If roosterfish are caught close to the beach is beneficial to bring them in and jump in the water to make sure they stay balanced and able to swim without tipping over. Roosterfish have a unique swim blather going all the way up into the inner ear, which make them able to amplify sound. They are the only specie of fish with this characteristic, and it messes them up really bad when the blather is filled up with unwanted air. The best thing to do is to make sure they stay balanced until they can handle themselves. After a successful release, the day continued with never ending action. Even though the roosters were boiling around the boat, they simply did not want to take our flies. Not until Katka grabbed my rod, because she was tired of casting her own 10wt. It did not take long before the gummy got smashed out of this world by a fish bigger than anything we had ever seen during the trip. After one of the most intensive fights I have witnessed, we could finally bring this fish to shore. A fish pushing up towards 100 pounds, and a true trophy. And remember, on a 9wt rod. The rest of the trip was just as relaxing and enjoyable it can be after both of us had already fulfilled our dream of catching a big roosterfish. I’ll let the photo gallery speak for itself. Gallery with all images below, click one image and then swipe/click for the next one.